My favourite Holiday is fast approaching and I thought I would start early at my decorating inside my home. I wanted something fresh, festive yet elegant. So when I first laid my eyes on The Home Depot’s new beautiful Martha Stewart Collection of Holiday Décor, I knew right away which theme I wanted for my home. Winter Berry Collection: Timeless and classic with with a colour palette of Christmas red, champagne gold and chocolate brown. Arctic Holiday: An elegant, snow-covered Arctic theme with a fanciful colour palette of ice white, silver, gun metal and frosted blue. Celebrate: A stately and sophisticated play on the classics with this elegant, traditional palette of gold and brown with a touch holiday sparkle. Midnight Holiday: A modern twist on traditional favourites with a contemporary colour palette of chartreuse, gun metal and dusty navy. Metallic Woodland: Embellishing the classic forest theme with a metallic sheen and gold-luster and silver leaf finishes. Colour palette includes: copper, champagne, charcoal, warm silver and gold. As beautiful as they all are, my contemporary yet elegant style gravitated very quickly towards the Arctic Theme. I visited my local Home Depot to begin my holiday decor shopping and felt like a kid in a candy store! Upon entering, the beauty of the season illuminated throughout with a line-up of The Home Depot’s newest collections including old favourites, lights, exterior decor pieces and artificial Christmas trees. I love how they separated the decor by the themes. Easier to find things! You can never have enough garland throughout the home! Do you think my husband would mind if I had the Eiffel Tower on my front lawn? Love it! These white deer are absolutely stunning. Planning to include in my exterior decor. I really appreciated how they laid out all the decor items separating by theme which made it so much more easier to find the pieces you wanted. And a few other decor pieces like large finial ornaments matching the theme and lots of silver and white sparkly picks. I personally love adding picks and flowers to my Christmas tree. It’s truly all in the details. They add some pretty texture and glimmer to your tree and help it to really stand out. Another thing you want to keep in mind when decorating your tree is to mix it up with the size and shapes of the ornaments. Do a mix of a big and small, finial and round, and of course, ornaments of sentimental value — those that you have collected over the years — you want to make sure you display those as well. For the fireplace mantle, make sure to create a nice vignette — it is, after all, a visual work of art for you and your guests over the holidays and tells a story! I love how my mantle turned out! What do you think? Add some of your ornaments in a Hurricane Vase for a lovely effect. The beautiful combination of silver, white and frosted blue couples so well with my white bookshelves and fireplace. We also had to purchase new throw pillows to fit in with the theme. Remember to take everything in the environment into consideration when decorating for the holidays. And less is definitely more. You don’t want to overdue your decor either. Grab some key pieces and then add some little touches. A ton of large items or items of the same size and colour, would really throw everything off. Imagine if everything I put up was only silver… wouldn’t be as appealing would it? When decorating our tree, we added a lot of new beautiful Arctic Holiday pieces but also coupled with personal ornaments that we have collected over the years that hold a special meaning to us. Our tree topper Angel is one of them and thankfully she’s in white! Dragonflies & kids’ first ornaments are among a few of the sentimental ornaments on the tree. And what Christmas tree isn’t complete without a little train track? We definitely had to pick up the Christmas Tree Train from The Home Depot as well for our little ones. Instead of placing around the tree (which you can do), we opted to place on the floor around the tree. Not only was it enchanting and sweet, it also served as distraction away from our ornaments from a very curious toddler! Win-win! Our little boy was so captivated! Thank you to The Home Depot for helping us create more special and beautiful memories in our home this holiday season. 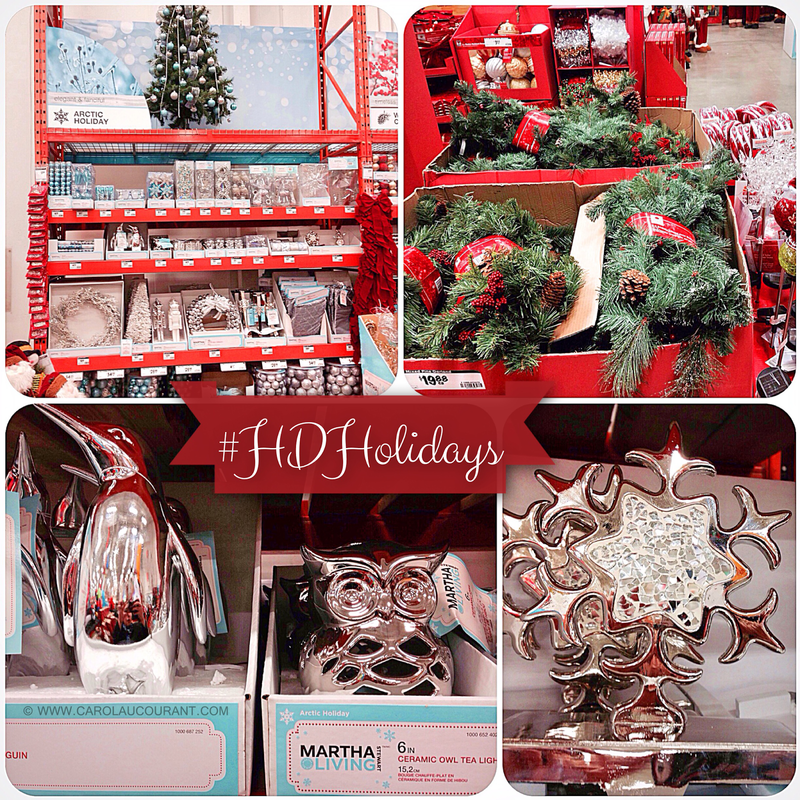 To learn more about The Home Depot’s Exclusive Martha Stewart Holiday Collections, click here. You can also visit them on Facebook and Twitter @HomeDepotCanada. 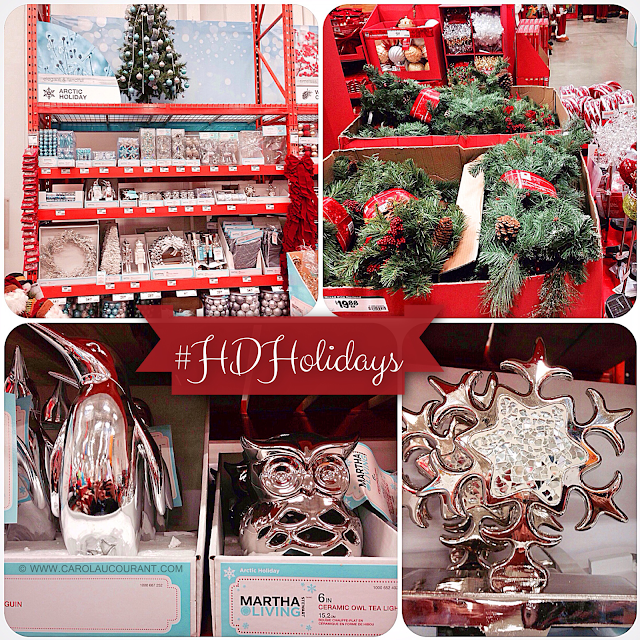 To view my shopping experience and more photos, enter hashtag #HDHolidays on Twitter, Facebook and Instagram. Are you excited to start decorating? Have you started already? I’d love to know what your holiday decor inspiration is this year! And here’s some more fantastic news! 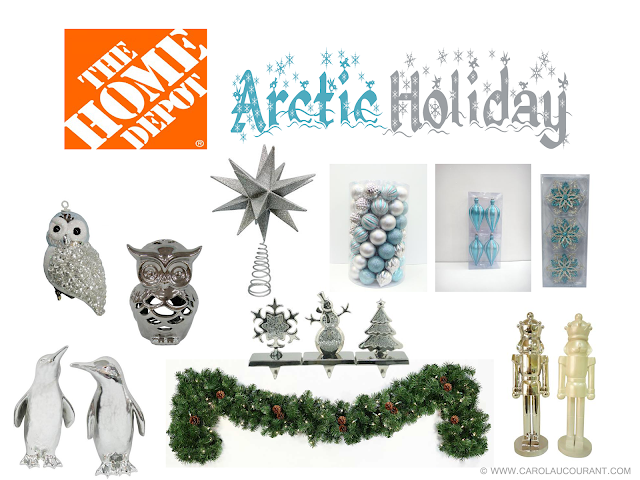 The Home Depot is being featured in my upcoming CAC 2013 Holiday Gift Guide;and also donating an awesome prize for the DIYer on your Christmas List! Disclosure: I received compensation to complete this review and reveal; however, as always all opinions expressed are entirely my own. LOVE the silver and turquoise. And I’d have that Eiffel Tower out all year round. I love how year after year Christmas is reimagined! Never met a Christmas picture I didn’t love! Thanks! I never knew Home Depot carried Martha Stewart!! I love her decor and have been missing it since Zellers left. I love your home with the holiday decorations! The white deers are one of my favourites. Nice early remind of the upcoming holidays! Nice pics! I was really impressed at the selection of Christmas decor Home Depot carried this Christmas! Wow! What a stunning display! And from Home Depot! That’s fab! Love the colour scheme…The silver birds are lovely! I didn’t know the Martha Stewart Holiday Collections were at the Home Depot…thankyou! Didn’t think I was going to do it but ended up changing some of my decor this year. Went to Home Depot to grab stocking holders, since they still carry the same ones I bought last year ended up buying “other” things. So much for saving. I love your decorations! So beautiful. I am also IN LOVE with the Eiffel Tower!! I tried to convince my husband that we “needed” it… but he didn’t agree, lol. I won’t give up though! I’m finished my decorating, and its basically a quirky collection of decorations I have collected over the years, but I am really loving the Midnight Holiday collection!! The work you did looks very proffessional, yet homey! I love the mantle garlands! I love the gold colour Tree Decorations.. So much variety Home Depot has to offer. I really like themed Christmases. We are going with red and gold this year. Nice photos! I never knew they had such cute holiday stuff!! Thanks for the shopping info. Wow your tree and mantle look amazing, it’s so nicely coordinated. I didn’t know Home Depot sold so many holiday decor items! The arctic holiday would be my choice as well. I actually changed to this theme a few years ago, wasn’t called arctic though, I just decided to go with the blue and silver. Wow, I had no idea Home Depot carried so many beautiful decorations!! Thanks for the post…its inspiring me to put more effort into my own decorating. I love Christmas! I don’t have a Home Depot where I live but I wish I did. Lovely decorations! I had no idea the Home Depot had so many beautiful holiday decorations! I actually was just browsing a few days ago and found out they had tons of adorable Christmas yard inflatables for great prices! We went and ordered one to add to our display this year. The little owl ornament is adorable. Next time my Dh has to go to Home Depot for boring stuff I’m going along just to look at all the pretty Christmas stuff. Such a Merry Mantel – You did Good! Beautiful decorations! The nutcrackers are great. I also like the colours mentioned in the Winter Berry Collection. I’ve always envied those with a Home Depot in their area…I’ve never been to one. I hope we get one on the west coast of NL one day! a magical land of light and color! I am a fan of garlands. I decorate with a victorian theme! Decorating for the holidays is one of the best parts of the season! Great picks. Absolutely STUNNING! I wasn’t aware that home depot sold such great products for christmas decorating. Beautiful tree and decor! We went with Home Depots “Winter Berry Collection”! We also got our inflatable Santa from there! not much else i can say except – WOW. I am seriously in love with that color scheme! I love the penguins! They are so cute!! Your tree looks amazing! I love the arctic collection decor that you chose! Home Depot has the BEST selection of the most beautiful decorations for Christmas! I always have to stop in and grab something new for our Holiday decor everytime I am there. WOW! I was in home depot on the weekend and never even noticed this collection. So beautiful and I totally have tree envy! Beautiful job. Simply stunningly beautiful and I love the train! Wow i had no idea they had so many themes! I will definitely have to go check them out! I LOVE the silver and blue together.. My tree has been those colors for a few years now. My sister would love that lighted Eiffel Toer Home Depot has! Love the Arctic Holiday Collection and really love the Eiffel Tower and the tree beside it! The tree and decorations are so beautiful. You did a great job. I love it. I am loving the owl tealight holder. I really like the silver colour. I had no idea The Home Depot had such a selection of Holiday décor!!!! Love the blue and silver ornaments. That colour scheme is so fresh! Your decorations look so good! Love the tree!!! Love all your decorating idea’s…..sure gives me some great idea before I start decorating! I just LOVE decorating and the holiday season. Its so fun with little kids. beautiful! i am starting decorating tomorrow..we have a train set circling our tree also..kids love it..but so does the cat! Gorgeous job! Also, you take gorgeous photos! I can just sit and stare all day and night if that was my tree! Looks beautiful! SO BEAUTIFUL! Your tree and mantle look fab! I am in love with this theme, Artic Holidays. The colours are so pretty. And that tree train is adorable. Will let my sister know about it. Looks absolutely beautiful. I really love the Arctic Holiday Theme. Also love the Celebrate theme as well. I will be heading over to Home Depot to pick some stuff up! Thanks! My son would go CRAZY for that train under your tree! The tree is gorgeous!!! Thank you, Cheryl. The tree train is super adorable! I’m sure your son will love it as much as mine. Such a pretty colour scheme! Looks beautiful! And I do like the pricing as well. Very reasonably priced items. Did you buy your tree at The Home Depot as well? Hi Nicole – thanks for the great feedback! No, the tree is our old tree which we kept. Although The Home Depot does carry a great line of trees! It turned out so beautiful. I love this theme! Just my style as well. Simply stunning! Thanks Jessica! It’s a lovely theme indeed. Wow your tree and decor look amazing! Great job! I didn’t know The Home Depot carried all this and will definitely be checking them out. Love the price point too! Thanks for the comment, Jennifer! The collections hit shelves October 28th of this year. Would love to know what you decide to go with. Happy shopping!